With unforgettable views of the sea and the countryside and the most exclusive five-star resort in Malta, the Golden Sands Resort & Spa is brilliantly located on the edge of a cliff overlooking the unique Sandy Beach. 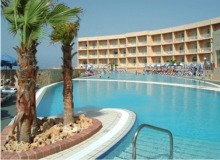 The Seabank Resort and Spa is located just across from Malta's most popular and largest sandy beach, Mellieha Bay and is surrounded by typical Maltese countryside. The resort is also fully accessible for wheelchair aided guests. All the rooms have two bathrooms, standard and adapted bathroom. The Paradise Bay Resort Hotel is very popular, spacious and comfortable. It is beautifully situated overlooking the picturesque sister islands of Gozo and Comino surrounded by the clear water of the Mediterranean.